A memorial garden to remember the September 11 terror victims has been opened by the Princess Royal to mark the second anniversary of the attacks. 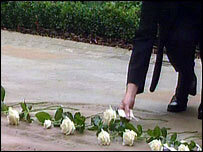 Princess Anne led relatives of the 67 British victims in laying a white rose for each of those who died. US Ambassador William Farish addressed hundreds of people gathered at the memorial in Grosvenor Square Garden, which borders the American Embassy in central London. He told them it was "only fitting" the site should serve as a living memorial as people of many different nationalities joined there to grieve. "Even as the horrific events of September 11 were still unfolding in New York, Washington and Pennsylvania, people by their thousands began to pour into Grosvenor Square," he said. "They came to offer help, to leave messages and to present tokens of sympathy and solidarity." The central plaque is dedicated to the Britons who were killed in the attacks on the World Trade Centre and the Pentagon. 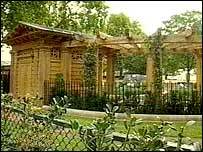 It is surrounded by an oak pergola and pavilion which bears the words: "Grief is the price we pay for love", part of a message from the Queen read out at a New York remembrance service one week after the attacks. The bulk of those at the ceremony on Thursday were families of the British victims, although they were joined by dignitaries such as Culture Secretary Tessa Jowell. Jim Cudmore, the father of one of the British victims, said it was appropriate to mark the second anniversary of the attacks with a more low-key ceremony, than those at St Paul's Cathedral and Westminster Abbey. He said: "Although it's a public garden and a public ceremony, it didn't feel that way today. I think the families felt it was very much their own private ceremony." Relatives asked for a garden as many have no graves to visit and felt it would provide somewhere tranquil to remember the victims. Princess Anne told the families she hoped they would find "beauty, tranquillity and space" in the garden. A metal girder recovered from the devastation of Ground Zero is buried beneath the garden. The half tonne of rusted steel from One World Trade Centre was placed underground because it was too distressing to be displayed. The memorial stone also features the words of American Henry Van Dyke's poem For Katrina's Sun-Dial, first read by Dame Judi Dench at a memorial service at Westminster Abbey in November 2001. Dame Judi returned to the service at the request of the families to read the Christina Georgina Rossetti poem "Remember me when I am gone away". The garden has been planted with flowers selected for their special significance and because they look at their best in the month of September. Princess Anne added: "In here we now have plants, both North American and British species, growing side by side." The national anthems of Britain and the US were played during the ceremony by the Thoresby Colliery Welfare Band, from Edwinstowe in Nottinghamshire. Elsewhere, some City workers remembered their dead colleagues in informal silences being held at the London Stock Exchange and financial companies. The British Consulate said few if any relatives of the UK victims were expected to travel to New York for the anniversary and no special events to commemorate them are planned in the US. But a Welsh choir performed a tribute to Britons killed in the twin towers, at a lower Manhattan memorial garden. About 100 British police officers also attended the Ground Zero commemorations in full uniform to show their solidarity with the New York officers killed in the attack.